Planning for a new baby can be fun. But it can be a lot of work too. 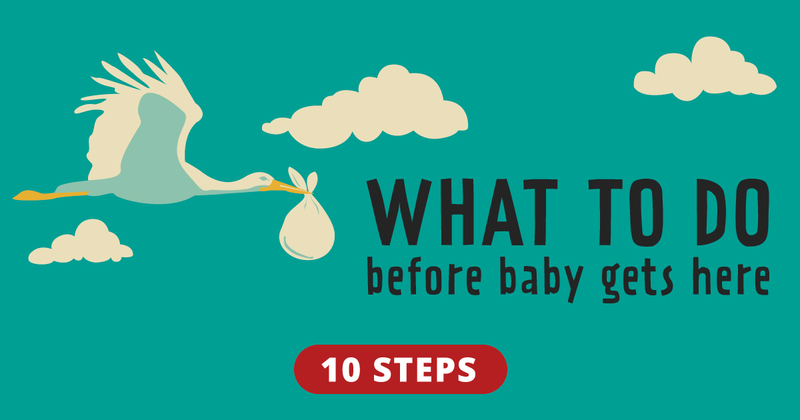 Here's a look at 10 steps you can take to get ready to welcome your new arrival. Ask the nurses to help you practice before you leave the hospital. You must have a car seat to take your baby safely home from the hospital. It's the law. Buying a brand-new, rear-facing car seat is usually the best choice. That way you can be sure it's in good shape and safe. Choose a car seat well before your baby arrives. Install the seat ahead of time too, so you can be sure it fits in your vehicle like it should. Practice taking it in and out of the car. Get advice on choosing a car seat. Whether you choose cloth or disposable, you'll need diapers—a lot of them. Plan on using about 70 a week at first. For disposables, stock up in advance with about three to four dozen in newborn size. If you can, get a few different brands so you can find out which you like best. Three or four pajama sets. You'll also want several receiving blankets to swaddle your baby in. It's best to buy a new crib that meets the latest safety standards rather than choosing a used model. Get a crib mattress at the same time. Make sure it fits snugly in the crib so baby can't get stuck between the mattress and the crib itself. Remember, to reduce the danger of SIDS, don't use crib bumpers. And don't put any other soft or fluffy items in the crib, including pillows, toys or comforters. And always put your baby on his or her back to sleep. A suction bulb and saline nose drops. A stroller can make life a lot easier for parents on the go. Try out strollers first. Look for one that is sturdy with a wide base, and is easy to set up and close. It should also have a harness and seat belt, as well as brakes that are easy to apply. Your baby will need regular well-child checkups. These start soon after birth, so it's good to choose a doctor ahead of time. You might choose a family doctor or a pediatrician. You might also consider a pediatric nurse practitioner. Ask friends and family for suggestions. Then make an appointment to meet with a doctor or two. Pick one who meshes with you and your family. Also, make sure the doctor you select is covered by your insurance. If you're going to need regular full- or part-time child care, it's a good idea to start researching early. There's a lot to consider. You'll need to choose a type of care. Then you'll need to pick a child care provider. You might want to start your search by contacting a resource such as Child Care Aware. You can visit their website at childcareaware.org or call 800.424.2246. Learn more about choosing child care. Look at the house from a baby's point of view. Get on your hands and knees and look for electrical outlets that need to be covered. While you're down there, check for hazards like small items a baby could choke on. Avoid long string or ribbons on toys or pacifiers. They could get wrapped around a baby's neck. Set your water heater to 120 degrees or lower. Always check bath water with your wrist or elbow before putting your baby in. Put safety gates at the top and bottom of stairs. DO YOU KNOW HOW TO USE YOUR CHILD'S CAR SEAT SAFELY?